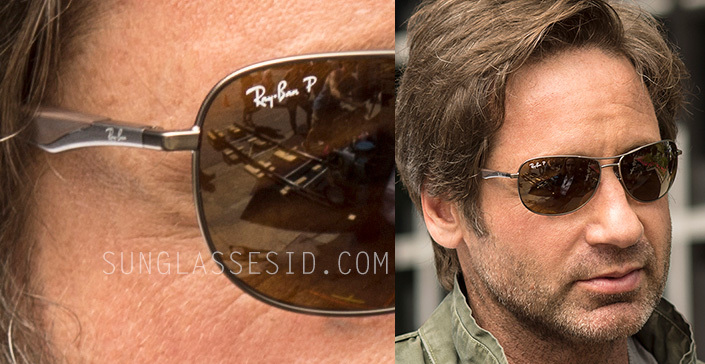 David Duchovny as Fox Mulder wears a pair of Ray-Ban RB3519 sunglasses in The X-Files. These pilot shape shades from Ray-Ban's "Active" collection have a gunmetal frame, polarized brown classic B-15 lenses (note the "P" next to the logo on the lenses, meaning the lenses are Polarized). Get these exact same sunglasses on Amazon.co.uk (£95), eBay ($125) or SmartBuyGlasses ($148) or ShadesDaddy ($150). Or find the same model but in different colors on Amazon.com.